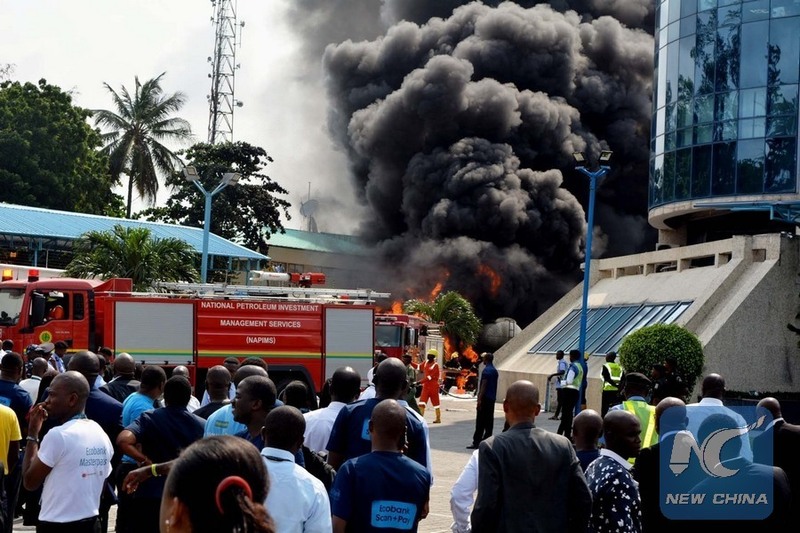 LAGOS, Jan. 12 (Xinhua) -- Scores of people lost their lives in a petrol tanker explosion on Friday along the Calabar-Odukpani highway in southern Nigeria's Cross River State, reports confirmed on Saturday. The incident occured after the tanker fell while trying to negotiate a bend, with residents rushing to the scene to scoop fuel. The rush resulted into a spark as some of them used metal containers to scoop the product. This led to an explosion which killed more than 20 people, an eyewitness told Xinhua. State Governor Ben Ayade pleaded with residents not to subject themselves to such avoidable deaths, adding that the state Ministry of Information and Orientation would begin sensitization campaign on the matter. "I am too shocked and traumatized to express the depth of my grief for the victims of the explosion," said Ayade. Chidiebere Nkwonta, Sector Commander of Federal Road Safety Corps in the state, confirmed the incident, saying the tanker fell off the road side. "We suspected the incident to have happened out of speed violation on the side of the driver. He was slightly injured when my men visited the scene," he added. "We did our best to ensure safety around the scene by ensuring free flow of movement around the area," he told Xinhua. "Unfortunately, at night, some people went there and started scooping fuel and there was an explosion that resulted to mass casualty," said the road official. "I want to use this medium to advise people to stop scooping fuel from fallen tankers laden with petroleum product, it's not safe," he said. Some of the victims who sustained third degree injuries were currently receiving treatment at the University of Calabar Teaching Hospital. The past few years had witnessed a string of pipeline explosions in Nigeria. Some of such incidents happened as locals tried to siphon fuel from the pipelines. According to reports, at least 150 people were killed in a pipeline explosion on May 12, 2006, in a village to the east of Lagos, the country's economic hub, while locals were drilling into it.